Okay, so this is cool, a gadget that will let you see behind those hard to reach places. Have you ever wanted to see what’s in between your walls without taking down your whole wall? Well you don’t actually have to. 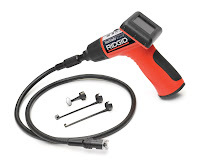 This SeeSnake Micro Inspection Camera from RidGid will allow you to see your house’s most hard to reach places (not recommended for perverts). The SeeSnake Micro Inspection Camera has a 2.4 inch LCD with 160x234 resolution, a 17mm camera, and 2 adjustable LED lights. The SeeSnake Micro Inspection Camera’s cable will allow you to reach about 3 feet but is expandable up to 30 feet with the optional extensions. The SeeSnake Micro Inspection Camera is a great tool for those Do-it-yourself fanatics. Hmm, I don’t know about you but I could see a lot of uses for the SeeSnake Micro Inspection Camera. You probably could use it as a spy camera though you won’t exactly be able to record what you see. And I bet perverts are thinking about great ways of using the SeeSnake Micro Inspection Camera. Well whether you’re a pervert or a Do-it-yourself kinda guy, the SeeSnake Micro Inspection Camera would be a great addition for your “tools”.